For a couple who decided to name their cocker spaniel Color, a beige and white interior just wasn’t going to cut it. That’s the situation designer Caitlin Murray and film editor Mike Parzynski faced with their historic Craftsman bungalow in Los Angeles. 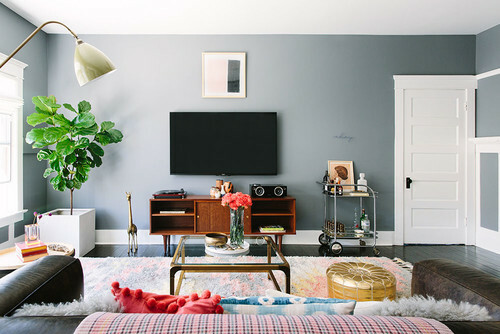 Murray took charge, introducing colorful accessories against a gray backdrop for the living room, electric blue cabinets for the kitchen and quirky art pieces for the bedroom to amp up the lifelessly neutral home. A previous owner renovated the house before Murray and Parzynski moved in, so it was already in great physical condition. To put their mark on the home, the couple set their focus on minor updates, like changing light fixtures, painting walls and ceilings, and fully furnishing the space with a sense of freshness that didn’t detract too much from the historic character and charm. 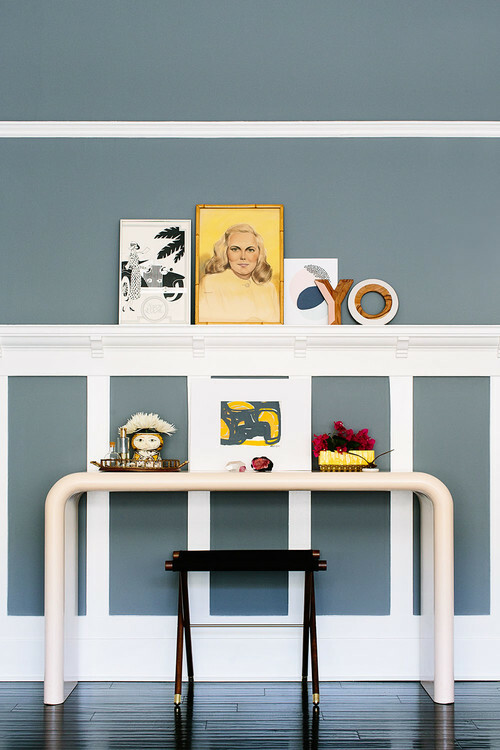 Her first step was to choose paint colors that would play up the gorgeous original moldings and trim. Here, in the living room, this mid-tone gray contrasts beautifully with the white trim. A healthy dose of purple in the gray paint also provides a cool-toned backdrop for the colorful accessories, which have a lot of pinks and blues in them — specially the ikat fabric on the throw pillow Murray brought back from a trip to Istanbul. She says she tried to strike a balance between her boyfriend’s aesthetic and her own by mixing pastel colors with the gray walls and a chunky leather sofa. “It was a fun experiment to find equilibrium between all of the elements, and ultimately create a home that exudes both of our personalities, creating our perfect starter house,” she says. To provide additional harmony, she threw in a warm metallic gold Moroccan pouf. “I love the effect of brass and gold with the rich leather and cool gray,” she says. 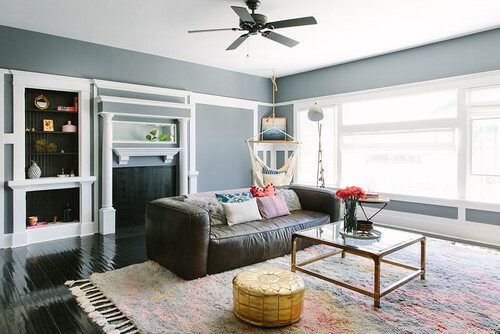 A previous renovation blocked up the fireplace and tiled over the opening, so Murray painted over it with a matte black paint so it would recede to read more like an opening. The mirror above the mantel is original to the house. More decorative trim adorns the wall opposite the windows. Murray picked up the pastel portrait of the lady signed by “Federico ’47” from a flea market. The print on top of the console table is by an artist named Arefi, and the 1920s piece on the left side of the ledge is from a thrift store. She found the other pieces on the ledge at West Elm. When they bought the house, Murray and Parzynski knew the existing dark wood finish on the kitchen cabinets and overall dinginess of the space had to change. The cabinets were in decent shape, and the couple didn’t have the budget to add new ones, anyway. 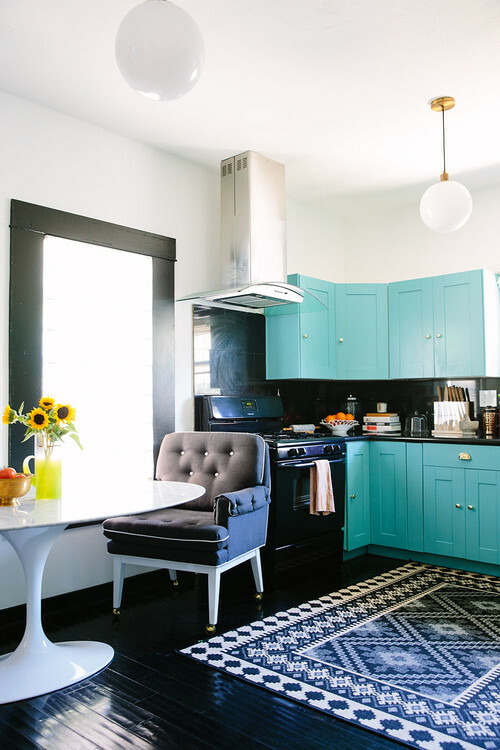 “So I decided to just have some fun and paint the cabinets a crazy color,” Murray says. The bright blue cabinets, crisp white walls with black trim and the existing black granite countertops brought some “modern sense” back into the kitchen, she says. Brass cabinet hardware adds contrast and warmth to the vibrant blue. A patterned indoor-outdoor rug resists stains. Murray covered an empty cabinet space intended for an unwanted microwave with a kitschy framed floral artwork. Murray painted and reupholstered two midcentury gaming chairs given to Parzynski by his mother. “They were in horrible shape — tattered maroon leather,” she says. The fabric is black linen with white vinyl piping. Initially, Parzynski wasn’t on board with the peach-colored walls in this guest bedroom. But painting the 9-foot ceiling matte black helped balance the color and win him over. A striped throw blanket, Moroccan pouf, black linen Roman shades and geometric print rug also help balance the peach walls. The bed frame is upholstered in a navy blue Belgian linen-cotton. The side tables are gold bases with marble tops. Murray has had this Buddha chair for ages. “It seems to be everyone’s favorite piece,” she says. The flea-market stacked trunks and artwork hide an Internet router and wires. A white dresser with Lucite handles continues the retro-meets-modern look. A rope mirror hangs above an animal head sculpture that holds an ostrich egg, a piece that was in Murray’s home growing up. 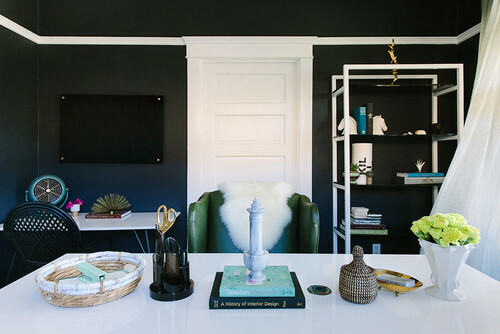 Murray converted one of the bedrooms into an office to run her Black Lacquer Design firm. Warm and cool metals mix against bluish-black walls. Murray reupholstered the pair of wing chairs in rich bottle-green leather. Murray designed the white bookshelf, made of welded steel and powder-coated in a glossy white. Its shelves are a smoky brown Lucite. What looks like a screen on the left above the desk is actually a smoked glass dry-erase board. The office connects to a Jack-and-Jill bathroom that leads to the master bedroom. 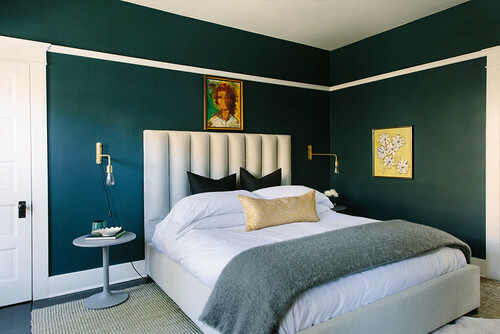 As with the peach walls in the guest room, Parzynski wasn’t initially keen on the wavy seafoam-green velvet upholstered headboard she designed and had fabricated for their bedroom, but he trusted Murray’s vision. She pulled colors from the artwork, which she bought at a flea market, for the accessories. A black lacquer and brass dresser showcases some of the couple’s favorite retro knick-knacks, like the Siamese cat figures Murray received as a gift years ago. “They have blue rhinestones for eyes, and I love it, because I had two Siamese cats as a kid,” Murray says. The blue glass head belonged to Parzynski’s grandmother.